I know how much you care about your patients. I know how many times you have told your patients that they need to exercise, manage their stress or reduce their weight. And I know how utterly frustrating it is for you as a health care provider when they return to your office still in pain, still stressed out, still obese. I know because I was one of those patients! Every time I left my doctor's office, I thought to myself, "Okay...so I have to reduce my stress, start exercising and lose weight...but HOW?" My personal reality was that I was TOO TIRED to exercise; I was TOO OVERWHELMED to manage my stress; and EVEN THINKING about losing weight seemed to pack on more pounds of pain. My doctor really cares about me....but I couldn't do what he asked of me. And because I couldn't, I cancelled my next appointment for him to check on my progress, not once but again...and again...and again. I was filled with a shame that only grew each time I cancelled those appointments. How could I face him again? So I didn't...and my health challenges continued to deteriorate. What if I told you that there is a program of exercise that is gentle enough to overcome all of the following obstacles: feelings of overwhelm, fatigue, obesity, joint stiffness, bones that need careful healing and strengthening? What if there were a program that was truly easy to learn, easy to do, easy on the joints and that provided maximum evidence-based health benefits with a minimum amount of movement? Well, I am absolutely delighted to tell you that such a program not only exists, but that I myself found it so effective in helping to improve my health issues that I undertook the training to become a Certified Instructor for it! That program is Dr. Paul Lam's Tai Chi for Arthritis (TCA), the Tai Chi program that is promoted by the American Arthritis Foundation. TCA is gentle enough to assist your patients with joint discomfort and back pain, and strong enough to assist your athletes with rehabilitation after injury. 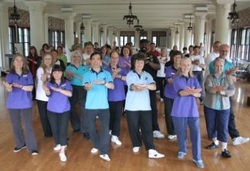 The Tai Chi for Arthritis program is based on Sun style tai chi, chosen because of its unique combination of healing Qigong and Tai Chi movement. Besides the fundamental set of 12 movement tai chi, it contains warm-up exercises, cool-down exercises, and Qigong breathing exercises. E-Z Tai Chi for Health is the Tai Chi for Arthritis program with added features from my Tai Chi training. If you are recommending a patient with arthritis, please note it on the form (below) and they will receive all the extra special care for arthritis patients as taught in the TCA instructor training. My classes are taught both seated and standing to accomodate a variety of patient needs. Please print out and read the Tai Chi Fact Sheet below this letter. I have also provided several research studies and references for you. Review and download the appropriate forms for your patients to bring to class. If you would like more information, please use the form on the home page to contact me. I am looking forward to offering your patients this special program as part of their care plan.